The city Akhetaten (today: Amarna) was built by Pharaoh Akhenaten (Amenhotep IV) in only three years of construction as his new capital and was occupied from 1343 BC. 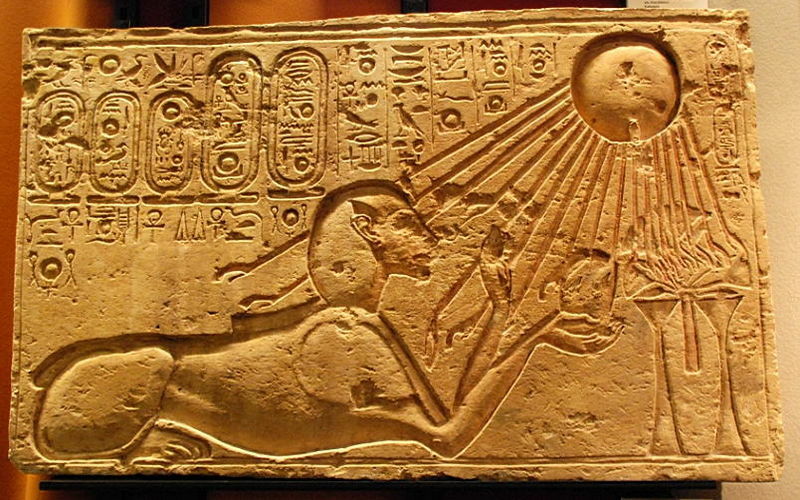 Akhenaten had established a new monotheistic religion for the sun god Aten in order to replace the traditional egyptian gods. This was done to liberate the Pharao from the influential priest castes of whose consent and support, the Pharaohs were highly dependent. The new capital was meant to form the basis for a long term change in Egypt. The temple of the sun god Aten was to be the new central and most important temple in Egypt and was meant to replace the temples at Karnak and Luxor. In the Aten temple there was no ritual worship of images of the sun god. The sun and the sky were worshipped directly instead. For this reason, the building had no roof, so that the cult could be carried out under the open sky. The city Achet – Aton or Amarna is situated in the combination of highly energetic, magnetic, royal fire sign of Leo the sign of the Sun with creative, innovative, emancipatory, rebellious air sign Aquarius the sign of self-finding, revolution and reconnection with the spiritual plane. This correspondence is valid here for the morphogenetic radius/field level 2, which explains how the construction site of the new city is embedded into the region. As the Sun is the ruling planet of the star sign Leo the position of the project of a capital of the Sun God in his own sign and territory is not only highly symptomatic. Even though the clairvoyants, highly educated architects, geomantists and other advisors of the king had no means to calculate an astrogeographical world map the resonance of the astrogeographical cconstellation with the ideal of a city for the Sun God is outstanding. First of all the combination of Leo with Aquarius stands for the euphoria and enthusiasm with which the new religion was developed and spread. Both signs though opposites tend to have an intense euphorical expression when it comes to heart-felt desires, aims and ideals. This is the particular quality of the polarity of Leo as the sign of the heart with Aquarius as the sign of reconnecting with the true self: their combination relates to a spectrum between euphoria and mania. The principle of fixed sign Aquarius, the simile of the sky indicates that in addition to the Sun the Sky was part of the concept of the cult of Aten in Amarna. The Sky is the place that reconnects us with the dimensions of outer space, the stars and the consciousness about the greater and higher dimensions of reality. Aquarius the sign of Uranus the god of the sky relates us with the true dimensions and potentials of our situation as human beings from an abstract point of perception. This function of Aquarius has often been trivialized as a mere function of providing inspiration for new ideas, inventions and practical use as in the pederastical myth of Ganymede. But the reconnection with the full awareness of the dimensions of life on earth in relation to unlimited time and outer space includes also important information about the actual situation of human existence, our immortal souls and spiritual origin from the plane of the abstract. In fact the impact of the waters of inspiration delivered by the water bearer to the plane of mental perception is a mere side effect of the reconnection with the plane of abstraction. This is because “self-finding through reconnection” with the spiritual origin is as essential for the physical survival of organisms as the physical functions themselves. Therefore I want to recommend considering that Aquarius should be seen as the sign of religion in the sense of reconnection with the spiritual origin. If religion is defined as a mere system of mental explanations and beliefs other signs such as Scorpio (dogma), Sagittarius (philosophy) or Gemini (information) would have to be used as valid explanations for the terms god and religion. The astrogeographical position of Amarna in Aquarius the sign of self-finding does of course describe the “Akhetaten Project” as a revolution carried out by Akhenaten. In the light of Aquarius his revolution appears to have been an attempt to reconnect the country and the government with its full potentials in times when the development of culture was blocked by the corrupt caste system. 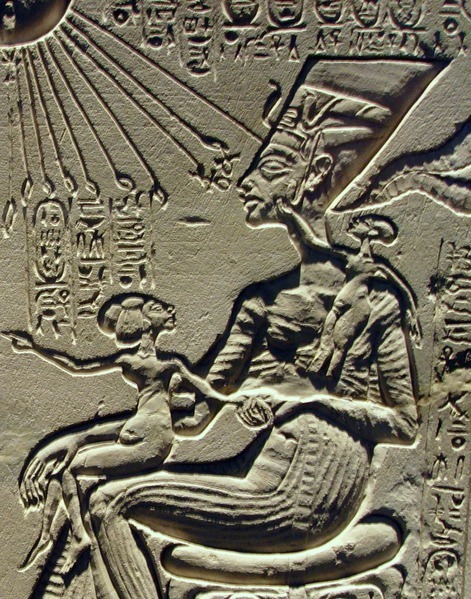 Akhenaten changed the state religion and deprived the most influential caste – the priests – of their power. Akhenaten`s act to free himself from the gods of his ancestors was an outstanding act of self determination. The courage to do such a thing meant emancipation not only from the traditions, deeply rooted beliefs and the effective and successful magic which over thousands of years had seemed to hold the country together. Spiritual air sign Aquarius alone would not explain the courage and self-centeredness of this Pharao who attempted to centralize the pantheon of gods on the pharao as the incarnation of the Sun god. This is why it needs to be understood that in addition to Aquarius the role of Leo for the definition of the new monotheist centralized religion was of the highest importance. The astrogeographical coordinate of Akhetaten in Leo does not only stand for the resonance of the Sun god with his own sign and territory. It does also stand for the courage to claim the right of an individual man to make such a self-confident, self-centered decision as to cut the chords with the gods of his ancestors. Leo as the royal sign may be concluded in the case of Amarna to be archetypally symbolic of the independence of human individualism from determination from the gods. Leo is the most important indicator for french culture and Aquarius one of the two coordinates of the french capital Paris (located in Aquarius with Sagittarius for field level 1). Paris as the most important city in the history of revolution in Europe as well as of the installation of a king as a Sun King (Louis XIV) reveals some fascinating historical and astrogeographical parallels to the Akhetaten project. The city and region of Jerusalem like no other stands for the era of the dominance of monotheist religions. The Jewish, Christian and Islamic religions have their origins in the region of Jerusalem. The astrogeographical constellation here brings Aquarius as a major indicator for religion together wirh highly dynamic, aggressive, unicellular fire sign Aries the sign of warfare. Christianity and Islam and through them the Jewish religion are the most successful religions in history. The christian and islamic empires spread all over the planet by the means of conquest and with the help of the installation of the monotheist religions as the ruling ideology in the conquered countries. Buddhism may not be a monotheist religion in the sense of monotheism, as it was defined later. But the the introduction of Buddhism as the official state religion by Ashoka during the 3rd century BC can be regarded as a definite step in the direction of monotheism. Buddhism was employed to fight native religions and powerful priest castes and establish a state religion in order to unify conquered territories. Ashoka`s capital Pataliputra (today: Patna) was located in the controversial constellation of two opposition signs: fire sign Aries indicator for warfare with air sign Libra.